Apex Mountain Resort offers Day Tickets priced right for everyone. We have dedicated pricing for our Adult, Teen, Junior, Senior, Masters, University Student and Child guests. 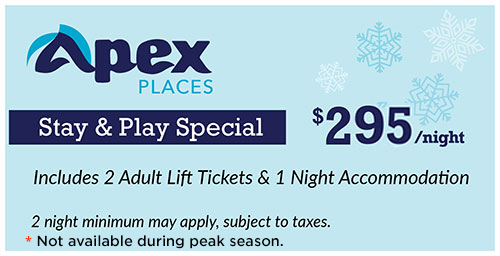 As well, Apex offers both single and multi-day lift tickets. See Day Lift Ticket pricing listed below! Listed prices DO NOT include Tax and all prices are subject to change without notice. Valid from 12:30 pm – 3:30 pm. Tickets are available for purchase at 12:00 pm noon from Apex ticket windows. *Please note: Multi-Day Lift Tickets are sold to use on consecutive days only.